There are many good questions the author, Denzi Yeshi has raised in the article [Reinventing the Art of Protest]. However, it would be difficult to comment on those questions especially when the author has not made his take on those questions explicit even though it is possible to decipher where he is going with those questions. One question in particular stood out for me: “Aren’t Tibetans disproving His Holiness the Dalai Lama’s message, ‘Tibetans are not against … and communist party”. It is safe to assume that the author’s implicit answer to this question is yes. I feel that the line between the Chinese people and their government is very fuzzy, to say the least. Not directly mentioned in this article, but one of the messages of His Holiness of late has been that more and more Chinese people are taking interests in our cause and perhaps support it. We know the effects of such messages and lines on our people. Denzi’s article is a case in point. Such lines are used, for instance, to restrain Tibetans from undertaking numerous protest events. Furthermore, the Tibetan leaders issue dos and don’ts at protest events like the speaker of the TPiE did recently. There was a statement against burning Chinese flags. What it means to gain interests and trust of the Chinese people need further elucidation. The proponents of such lines have the moral and intellectual obligation to come up with some numbers; the number of Chinese to support our cause, which when achieved will make a meaningful difference to our cause. And then show specific activities initiated to achieve that magic number. This will give us reasons to be hopeful. Otherwise, such lines are hollow, misleading, and misguided. However, such messages play very well with the Tibetan audience, but this will only hamper our movement. This could hamper our movement because increasingly—this may not be apparent unless we take a close look—nonviolent methods are taking the shape of inaction. To somehow suggest that inaction will produce the best results and accordingly resort to a strategy of inaction would deal a severe blow to our movement. Nonviolence and inaction, by the way, are not synonymous. It would be unfortunate if it becomes so in the CTA’s dictionary. Nonviolent civil rights march in Memphis, Tennessee, U.S.A, March 29, 1968. Martin Luther King Jr. had come to support the Memphis marchers when he was assisinated on April 4, 1968. Am I suggesting that we should be gung ho about hurting the sentiments of the Chinese people and should do so deliberately? Absolutely not! We pray for the well-being of all the sentient beings, including Chinese. We made our points abundantly clear in the last 50 years about how much respect we have to the Chinese people. Let us go beyond making that point repeatedly. In this critical moment, however, interests and sentiments of the Tibetan people should take precedence over any other groups. The foremost responsibility and obligation of the Tibetan leaders should be to safeguard and promote interests and sentiments of the Tibetan people. Being obsessive about other’s interests at the cost of our own movement may be indicative of self-defeatist mentality. Individuals with self-defeatist mentality are not fit to lead our people at this crucial juncture in our history. Having said that, I am confident that any method we choose to employ to bring up our legitimate concerns against the PRC at numerous platforms will not upset many Chinese; mainly because they are intelligent and smart people. There would, however, be a certain group of people who would never be happy with whatever we choose to do or abstain from doing. Therefore, it would be suicidal to make any attempts to placate them. We should have learned this lesson by now. Let me go back to one of the questions the author raised, “Aren’t Tibetans disproving His Holiness the Dalai Lama’s message…” It can be inferred that the author totally buys into those lines of His Holiness. Unfortunately, often times messages of the Tibetan leaders are short. And they do not substantiate them. In the future, I hope that the Tibetan leaders will share with us their reasoning behind any lines they choose to use. It would be beneficial if individuals and organizations could organize discussions and debates on the merits and demerits of our leaders’ ideas. Ideas should be thoroughly vetted before we begin to raise questions about how acts of patriot Tibetans disprove His Holiness's point or anyone's point for that matter. Our key orientation should not be about proving or disproving His Holiness’ points, especially when those points are not thoroughly vetted. We should be guided by actions and thoughts that will best contribute to the attainment of the goals of six million Tibetans. The key message of Denzi’s article was to employ a protest tactic of a “plea request.” Accordingly, slogans should resonate with request, plea, and hope. The author went over some details about how future protest events should be organized displaying those slogans. In short, it is safe to conclude that the author is advocating a policy of appeasement. 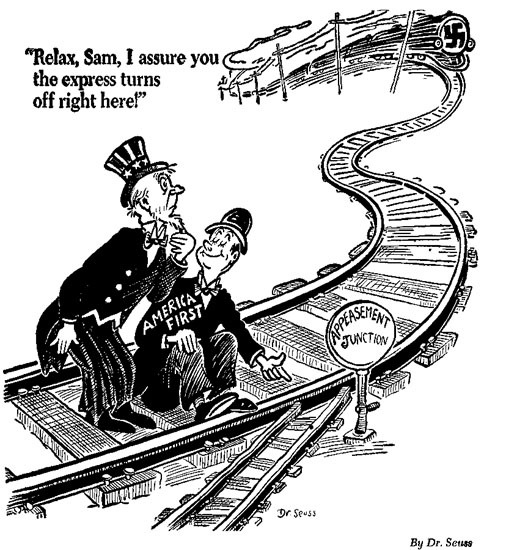 The "America First" committee advocated appeasing Nazi Germany to avoid conflict. However, the author’s argument to adopt protest tactics of a “plea request” is incomplete when he entirely left out the discussion on the appeasement policy of the CTA. Therefore, his arguments become unconvincing. The appeasement policy the author is advocating is not different from that of the CTA. The CTA’s appeasement policy is as old as the middle way policy and we all know what resulted from that appeasement policy. I am very appreciative of the author’s attempt to think outside the box. An agility to adapt to the changing condition will not only survive our cause, but also enhance it. However, we should be wary of reinventing the wheel. Having said that, I hope that Denzi will write, in his future article, about how his appeasement policy is different from that of the CTA and how his appeasement policy will give us desired results, that is if the author has reasons to think that it is different. Therefore, it is clear that I am not nullifying the author’s arguments, but only probing the author further. This is my attempt to bring our intellectual discussions one notch higher.